We are a commercial paint shop and paint for local RV companies. There are two separate mixing rooms, 4 spray booths and 1 is capable of handling a full class A motor home. We are located in the center of the RV world and are able to paint anything from Class A's to small parts and do RV body repair in our dedicated RV paint area. We paint for major RV manufacturers in the area and have been in business 39 years at the same facility. Our commercial painting facilities are one of the few fully licensed by the Indiana Department of Environmental Management. If you have a Motor Home needing paint. call us anytime. 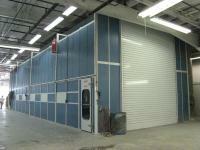 4 Spray booths, one is large enough to handle a full Class A motor home. We are the painters to the RV companies.